I live in the suburb of a medium size town in Kent, England. I love living here. I have been here a while. Fifteen years? Sixteen years? I’m not sure. I’ve lost track, which says a lot. The neighbours are great. They are so much more than neighbours. We laugh together, we play together. They are friends. There is this unspoken support that is there should you ever require anything. If that weren’t enough I am also blessed with peace. Our neighbourhood is extremely quiet and peaceful which makes it an ideal location for teaching meditation. I have grown accustomed to this peace. And like many things that we grow accustomed to we often become attached to them… And often with attachment, to anything or anyone, we are setting ourselves up for potential suffering. I spend a lot of time at home. It is not only my home, it is my workplace and my refuge from the outside world. So recently when my immediate neighbour announced the start of their building works, as an eternal optimist I decided that it would be fine. Maybe I would have to go out more, however, it would all work out. Yesterday morning I was lying in bed enjoying the warmth and the peace of a Saturday morning without a care in the world, not even knowing what time it was. And then the noise started. It was one of those moments when you just flip. You know the ones. We all have them. I was beside myself. I didn’t know what to do. I felt threatened, enraged, extremely challenged and helpless. It was the proverbial straw that broke the camel’s back. My expectations of a quiet day catching-up at home were shattered. Quite literally. I expressed my discontent to my neighbour and as much as I wanted to let it go I struggled. I wrestled with it all day. Even meditating didn’t help much. This morning at about 4am I awoke with the most beautiful epiphany. You know those moments of insight that we often term lightbulb moments as they enable us to see things that we had not seen before. 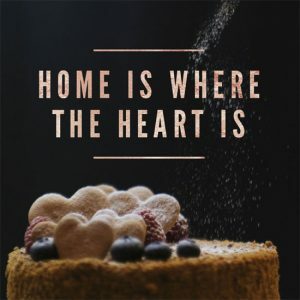 The words that hit me between the eye were “Home is where the heart is.” How many times have we all heard that? Yet in that moment I realised that home is literally where the heart is – inside of you. It’s not a place or some bricks and mortar. As important as it is to have a place to come back to, to feel nurtured and safe that nourishes us, our real home is in our hearts. So the more we open our hearts, are heart-centred and operate from this place of loving wisdom, the more we are at home, right here, right now, wherever we are physically.